Aaaaaand you´re guessing right! Another thing I got since Berlin. ASI Berlin gift bags are awesome. Make sure to be there in 2015! You´re wondering why is this post came up that late? Well, I´m busy in these days and there are more products waiting next in line. Such a well done shape, huh? These new Fonky Fingers decks are just awesome and you won´t regret buying one. Even if you don´t like this graphic –> choose one you like. There are a lot of different designs to choose from and the shape and craftmanship is awesome. Look at the well done shape!!!! Like I told you some weeks ago there are a lot things going on at Fonky Fingers! The new lineup of wood/concrete/plastic ramps is super sick and the new boards well done fingerboards. How to order? At the moment the only way to order is via message at facebook (or get the at TNP! ), BUT I´ve posted a sneak peak of the Fonky webshop some weeks ago ;-) Fonky Fingers is a fingerboarder owned company and the guys had a great commitment to the project. Good work, good quality + progress! BTW: There is a Controlled Chaos #30 raffle! 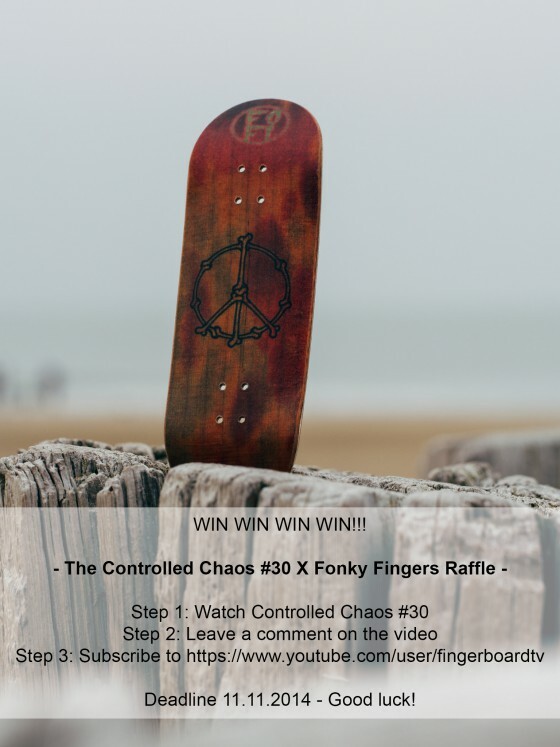 You can win a Fonky Fingers deck! Click! Grab some over here: Click! I normally don´t post online contest clips because I want to leave everybody with a fair chance to win the competition. But in this case I cant cant post it. Good job! Huge restock over @ TNP: Click!